TWSF carved our 22lb pumpkin over the weekend and decided to depict the eating habits of the rare cannibalistic rural Virginian species of pumpkin. 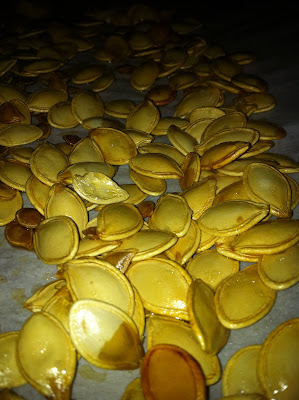 We were left with a bunch of seeds after the carving and decided to make roasted pumpkin seeds because at TWSF we never let a unique cooking opportunity pass us by. 1. 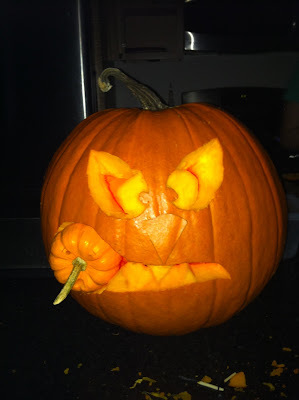 Scrape the innards from the pumpkin and separate the seeds from the guts. 2. Rinse the seeds under water in a colander. 4. Preheat the oven to 300 degrees. 5. Toss seeds in a bowl with the melted butter and salt. 6. Spread the seeds in a single layer on a baking sheet and bake for about 45 minutes or until golden brown, stir occasionally.